Piriform has released Recuva 1.46 and Recuva Portable 1.46, brand new versions of its free data recovery tool for Windows PCs. Recuva can restore both lost and deleted files from a wide variety of devices attached to the user’s PC, including hard drives, camera memory cards and MP3 players. Version 1.46 contains one notable new feature -- an option to scan folders for deleted items via the Windows Explorer context menu. It also promises better scanning of exFAT and FAT32 drives along with other minor tweaks and improvements. The new folder scan feature is only available in the main Recuva build -- it’s not accessible via the portable version. The option is added to the program installer and selected by default -- if left in place, users gain the ability to browse to a folder in Explorer, then right-click it and choose "Scan this folder for deleted files". Recuva will then perform a quick scan and display the results of its search, allowing users to quickly recover files from known locations. 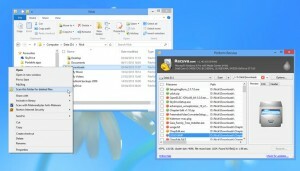 Recuva 1.46 also promised an improved deep scan tool for exFAT and FAT-formatted drives. It also adds new file extensions to the available filters (pictures, music, video, documents, compressed and emails). The latest build also promises improved scan statistic accuracy, better usability of the folder browser and improved uninstallation of menu items when the program is removed. A minor bug in the secure overwrite tool for exFAT file systems has been fixed, and the update is rounded off by subtle tweaks to the recovery wizard and user interface. Recuva 1.46 and Recuva Portable 1.46 are both available as a freeware downloads for PCs running Windows 2000 or later. Professional and Business editions are also available.